Fair-haired Auda has been mute since birth, and due to her strange looks and lack of speech, has been sequestered away from society for most of her life. Living as an assistant to her father, the paper maker, Auda dreams of one day penning her own work of art on her father's pages. Though Auda and her father lead a quiet existence, life in their bucolic French village is becoming increasingly fraught with unease, as some in the town are being accused of heresy against the Church. But Auda has more pressing problems, for her sister is contracting a marriage between the young girl and the town's unattractive miller, a situation that causes Auda no end of unease. In order to escape his attentions, she contracts herself to the vicomtesse as a scribe in the castle. As she spends her days copying poetry from the crumbling parchment of the past, Auda discovers that a group of inquisitors are bearing down on the village and that their intent is to burn those who they deem to be heretics. Soon Auda comes to realize that she and her father are in grave danger by the rumors of heresy swirling around the village, and that they may have to sacrifice everything to save themselves and the ones they love. Told with a bewitching style and voice, Watermark is a dark swirling tale of secrecy and fear, set in a time where being different can be deadly. From the moment I plunged into this tale, I realized that it was going to be a dark and treacherous ride. The story opens with the very dramatic scene of Auda's troublesome entrance into the world, leaving her motherless and disfigured. I knew just by this passage that Auda's life would be one fraught with difficulty and pain, and though there were some very joyous moments in the story, the tale lived up to my expectations. I liked Auda and felt a strange protectiveness throughout the story. She was, in essence, an intelligent innocent, unschooled in the ways of the world, yet still independent and brave. Though most of her life was spent hidden and isolated, she had the same dreams and wishes for herself that most young girls have: to find love, to be respected and valued in the community, and to practice her art. She was not the type of character to feel pity for because she never sunk into pity for herself, choosing instead to lead her life with wonder and acceptance. She had very strong family ties and I really liked the relationship between her father and herself. She was not only his apprentice but his friend and confidante, weathering the hardships of life right alongside of him. Their relationship was sharply contrasted with the relationship she had with her older sister, Poncia, who was always meddling and lecturing, trying to be the maternal force in Auda's life. I had a strong dislike for Poncia and felt her to be at times very cruel. Towards the middle of the book, Auda gets the chance to form a romantic relationship with a fellow artist. This was a nice aspect of the plot and tended to drown out the darker elements of the story, giving a nice balance to the narrative. As she begins to blossom in new ways, she grows beyond her small world of isolation and forges her way into the world surrounding her. The relationship between the two lovers was unique because it was not only forged in seduction and attraction, but also in mutual respect and admiration for one another's craft. Though the lovers have a difficult time rising above their situations and dangers, they are steadfastly loyal to one another and in the end are rewarded for it. I do wish that there had been a bit more focus on their relationship in the book because I really enjoyed reading about their times together and thought that it would be interesting to watch their relationship grow a bit more. There were also a lot of great inside details on the craft of papermaking in the book. It's a craft that I had been curious about but knew very little of. The details of paper making were imparted with a great deal of clarity and filled in the plot very nicely. So much about this type of artistry would probably be foreign to most readers, but it was all conveyed with enthusiasm by the author and made for very interesting reading and speculation. I had no idea that it was such a detail oriented craft and that it was not at all popular in its early days. The sections that dealt with the town's harassment by the inquisitors was truly frightening. Most of the suspected heretics were nothing of the kind, yet they were made to stand trial and torture and were most always executed, no matter what their level of guilt. It was in these sections that the story became gritty and raw. The fear of the Inquisition was a palpable vein running through the characters' lives and it seemed no one was safe from being arrested and burned in this town that had previously been peaceful and sheltered. This aspect of the plot felt very authentically documented and was thoroughly realized within the narrative, and at times, it was the crux of the story. Even the nobles of the town did not escape suspicion, though they were more capable of bartering themselves out of harm's way than most of the other villagers. I think that the author was amazingly adept at creating tension and fear in these scenes, and for me, these were the parts of the story that really stood out with distinction. This book had a great dark and foreboding atmosphere and some very moving and dramatic plot elements that gave the story an edge over most other historical fiction of this kind. At times though, I felt that the plot moved a bit slowly and in a more roundabout way than what I had been expecting, and I found at times that I had to be patient with the story. If you are the type who enjoys historical fiction that centers around lesser known times and events, I think this book might be of interest to you. Readers who enjoy courageous and independent female characters might also appreciate this book. Though the book was involving, it was not overly dense, and aside from the plot lagging at times, it was an entertaining read. There are also few surprises tucked into the narrative as well, which I think will draw its readers deep into the recesses of the story and give them something to ponder. 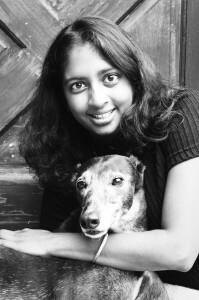 Vanitha Sankaran holds an MFA in creative writing from Antioch University. In addition, her short stories have been published in numerous journals, such as Mindprints, Futures, Prose Ax, and The Midnight Mind. She is at work on her second novel, which is about printmaking in Italy during the High Renaissance. I read and reviewed this book as part of a TLC Book Tour. Please continue to follow the other tour stops for this engrossing novel! I didn't know this was by a South Asian author! I heard about a Victorian mystery novel by a Canadian Asian author, so it seems to be a burgeoning trend (though I wish more Indians would write fantasy and set it in the East!). This book has really caught my interest in reviews, though I'll keep your reservations in mind about the slowness of the plot. This book sounds pretty good, dark but good. I've seen it around, but haven't given it much thought, but you're review has made me want to add it to the list. Thanks! This sounds fantastic. I've had a bit of a slump in historical fiction this year, but dark and atmospheric books are always good choices for me. Great review! I don't read tons of historical fiction, so this might not be for me - I like books with a faster paced plot. This sounds fascinating! There's something so romantic (to me at least!) about a book that focuses so much on paper. I think this book sounds fantastic! And the things that happened long ago are horrifying, but you realize that we really haven't come that far. I love characters who don't pity themselves for whatever circumstances they have; it's very inspiring! Thanks for being on this tour! I'll have to come back and reread your review later on as I'm going to be receiving this book. I'm glad to see you liked it. It definitely sounded like one I would like. Love independent and courageous females in books. Looking forward to reading this one. This is one I have seen a few times around and I am getting more and more interested in. This book sounds interesting. It does appear it suffers a bit from first novel mistakes, but I'll definitely be on the lookout for more of this author's works!